Click here for a Detailed Feature List of Parashara Light Android Version! Parashara's Light Android Version is the ultimate and the most innovative Vedic Astrology Software for mobile phones & tablets! It encompasses the richness of the ancient vedic classics and also provides access to powerful research oriented tools. Why is Parashara's Light the Leader? .... is compatible to the widest range of Mobile phones & tablets. 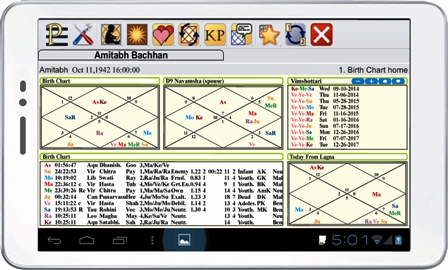 .... is the most technologically advance and exhaustive astrology software for a mobile phone & tablet. .... is available in multiple languages. .... has the most exhaustive atlas (50 Lakh cities) with automatic Timezone and DST Lookup. .... supports almost every astrological calculation and methodology. .... has 100% accuracy in calculations (certified by accredited national and international bodies). .... has the most friendly User Interface. .... is easily synchronised with Desktop Edition of Parashara’s Light. .... supports exporting output to PDF that can be e-mailed or printed. .... comes with a life long friendly Customer Support.